Okay, don't let the word Birkenstock scare you away! I know, you have probably either loved or hated them. I haven't "loved" them since I was in college. That is until I found the Gizeh. I ordered plain ol' black knowing they can go with anything and was prepared to send them back. Well, there was no need to send them back. They are extremely comfortable and I love the look on. My feet don't look wide like they did in the traditional Birkenstocks (with the double buckle). I should mention that I ended up sizing a whole size down for the perfect fit-the larger size left too much room in the toe area. I especially love the black leather because it is so soft-so no blisters for me this summer! Perfect pink is next on my list. 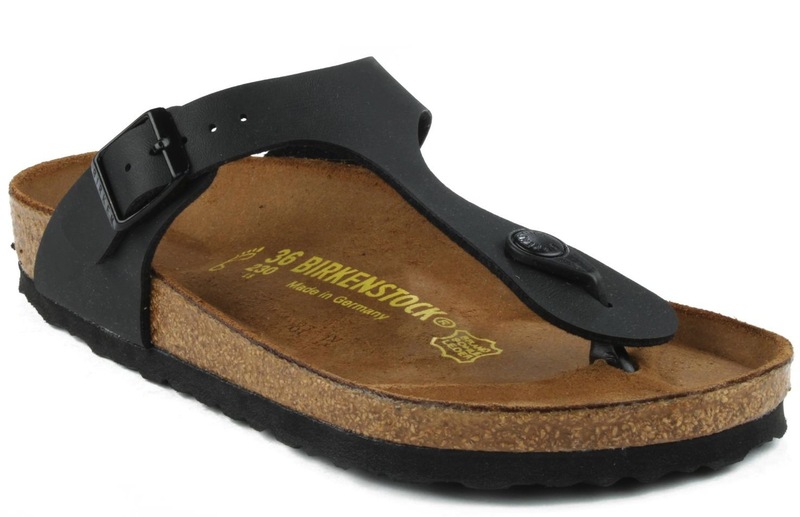 Do you wear Birkenstock's in this style or another? Or do you give them a thumbs down? Please share your thoughts! Find the Gizeh Birkenstock here. I need to invest in another pair. The patent leather are cute! I know the feeling-Lola has chewed up too many shoes to count. She was sniffing on my Birkenstocks when I got them a couple of weeks ago...I made a mental note that they aren't safe! I love your first line - don't let the word Birkenstock scare you away! I almost was (just kidding) but these are SO cute!!! They look super comfy too.